Feel great with our green food shot when you get half of your recommended servings of fruits and vegetables in a delicious, easy to take along, 2 ounce bottle. 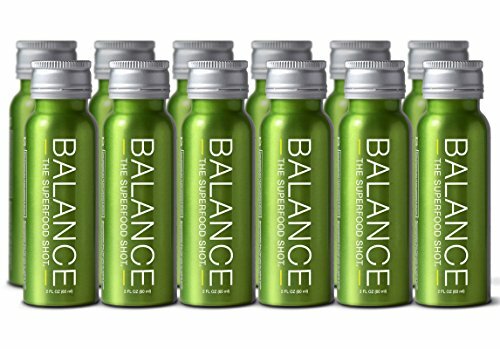 Balance the Superfood Shot is packed with a proprietary blend of nutrients from organic pineapple, lemon, carrot, beet, cranberry, blueberry acerola cherry, spinach, kale, acai, turmeric and more. This little shot of liquid goodness goes anywhere with you – simply chill, shake well and enjoy! See bullets and images for more details. This organic superfood shot is a product of Life Equals. Balance the Superfood Shot is free of eight major allergenic foods including: milk, eggs, fish, crustacean shellfish, tree nuts, peanuts, wheat and soybean. You can use Balance the Superfood Shot at breakfast in your organic green smoothie or kale shake, mid-day in place of energy shots as a after lunch pick-me-up, or anytime straight out of the container. EAT MORE FRUITS AND VEGGIES – Each of our wellness shots contain half a days serving of organic fruits and vegetables. This 2 oz. green superfood blend is nutrient dense and shelf stable, so enjoy on the go! FREE OF 8 MAJOR ALLERGENS – Balance is a healthy shot packed with powerful antioxidants and has NO Soy, NO Dairy and NO Added Sugar. It’s Gluten-Free, non-GMO, Vegan, USDA Organic and has 15 Organic superfood Ingredients! POWER PACKED INGREDIENTS – Get more nutrition than your average juice shot. Our organic superfood blend contains organic pineapple, lemon, carrot, cranberry, blueberry, acai, spinach, kale, goji berry, turmeric and more! ANTI-INFLAMMATORY AND ANTIOXIDANTS – Balance the Superfood Shot goes beyond a basic turmeric shot by including a host of vitamins and antioxidants. NO MORE PILLS OR SHAKES – Our green food shot is a yummy and effective way achieve the recommended daily supply of fruits and veggies. No more excessive juices and smoothies, messy powders, shakes, or pill and supplements replacements that don’t digest easily.